JoeSeki Black has about 50 on the board probably less, White has about 40. White is much thicker. Lucky: White 46 - Yes, Black has more territory. But at this stage of the game go is not only about territory, it is also about power. The one who has more thickness will expand his territories during yose. By how many points do you think Black is ahead? ChessWhiz: Hmm... maybe 25 points? Lucky: Well, that's correct only if you don't count any point for the white wall. So the game is closer than that and depends on how White use her thickness. Lucky: It is a very good idea to leave weaknesses in the black wall before living but you should see if it works first. See NewYearSRengo2002 B45 variation. JoeSeki: I was thinking of cutting at a for Black 45; White's wall is way too nice the way the game went. I was trying to put holes in it and cut it up before living. Black looks stronger in this fight. So I must have misread how White will play. Playing White 6 at a doesn't seem any better for White to me. But then again this is how I lose my games :) Kill big groups to win, or end up with nothing -- clearly I'm doing something wrong but can't figure out what :) Probably can best be described as "I'm a strong fighter but pick unreasonable fights" :) Does anyone know how to teach me to get over this hurdle? dnerra: Assuming you have read Lessons in the Fundamentals of Go, I suggest reading Attack and Defense - the book. Do you know that one? The book teaches very well how to benefit while attacking (indirect attacks, leaning attacks etc.) -- I found it very helpful! ChessWhiz: Black 45 - Strengthening the low black group. 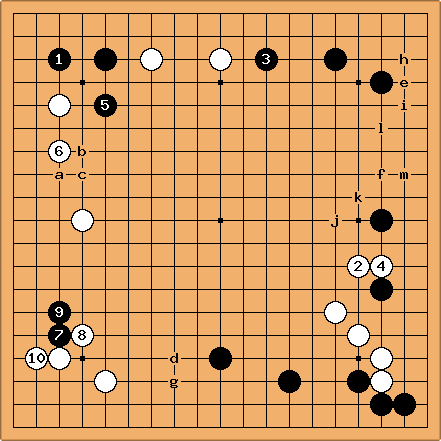 In my humble opinion, as long as this group lives, Black has a good game due to his extra territory. As Arno pointed out, White doesn't have much territory right now. Lucky: White 44 - White doesn't try to kill any black stones (unless Black leaves them to die). If Black lives on the second line then White should try to make a strong wall and the result would be better for her. JoeSeki: Black 43 - So far the direction of play is as I thought it would be. 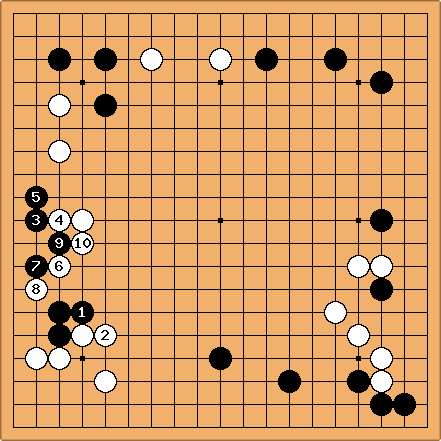 White did not cleanly capture the lower black stones, and is risking the top white stones. The battle that results from Black trying to get out, should capture something and then Black is settled on the side. 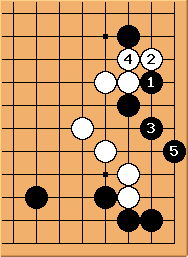 If White lets Black run out through the center then White's top stones come under attack. The real problem though is this. With all the attacking going on, where's the territory? I think this is my fundamental problem in getting stronger. I win my games by big kills - if nothing dies, I have no territory. Arno: does White have any territory at all apart from the lower left corner? Looks to me like White has a tough game before her. For example, White has no territory on the right side. The sequence 1-5 (connecting with a monkey jump) demonstrates this. One could go as far and call this group a weak group. I think the lower right corner is why White is behind currently. She invested too many stones, yet her stones are not secure. JoeSeki: I started this mess, I might as well see it through. Lucky: Well, I think Black 35 is an overplay. And I don't need to play below Black 33 so the ladder has no relevance. DaveSigaty: White 34 I don't see anything more inventive at the moment. White is thin both on the left and at the top. JoeSeki: Black 33. Looks like Black needs the start of a base here, even though it's open on the bottom edge. It should be good for one eye in the future (not really sure). Whilst undermining White's stones along the left side. The center still seems open to us for escape if necessary, and if White cuts that off, I think she runs us into the group above us, weakening it. dnerra: White 32. I thought about a as an alternative, but ended up choosing the normal move. DaveSigaty: Black 31: The standard reply. HolIgor: To make things moving let me play Black here as the Ongoing Game 2 approaches to its logical finish. I will be Black here. Please, report if anybody wants to help me. As the play tends to stop from time to time let us chose two dummies for the game. One for White and one for Black. It would be better if the strengths of these players were not very different. 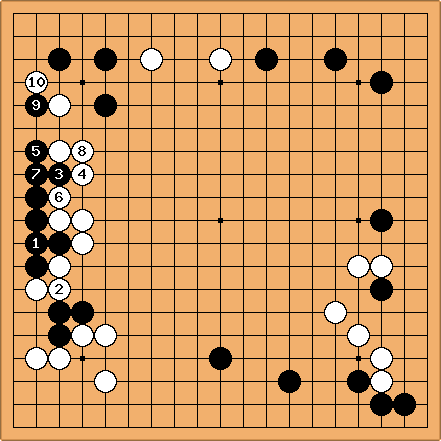 The dummies are encouraged to make any move they like if there is no contribution from other players in 48 hours. The moves by dummies can be retracted by any of the players but before the next move by the player of the same color. I can be a dummy for Black. Nonny? : (exhorting): Calling all players for Black back to this game, please! HolIgor (commenting): In my opinion two most remarkable features of the position are weakness of the white group at the top and thinness of the black stone on the right side. If Black could combine an attack at the top with some thickness on the right then Black would be doing alright. Nonny? : Locally, b looks best to me. This game is very low -- there are so few stones above the third line thus far. 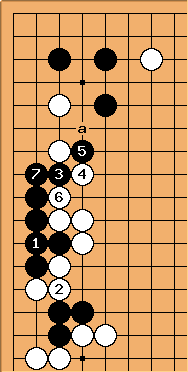 Also, d seems a line too high for White here -- g aims at an incursion into Black's moyo and there is no black response that doesn't overconcentrate black, without strengthening White. White f certainly is possible but to what effect? The thought of starting with the probe at e is quite interesting. Then, f or thereabouts as an extension makes sense later. However, who says that Black will block the corner at h? It seems equally likely that Black will attach at i and after the corner is decided, make a one-space jump out to j. Nonny? : Black 25. Compare White here. IronChefSakai: Black 23- I couldn't stand it, that move was just nagging me. I didn't want to lose sente, and it seems like a big play. I think it is good to avoid contact plays this early on. DaveSigaty: Black 21 accepting the corner. I think that White has to settle too many areas to be happy here.